For organized groups, the Museum of Poles Who Saves Jews organizes special trips along the trail of life and the Holocaust of the Jewish Markowa community. Their participants can also learn about the history of the time of occupation in nearby villages, which makes it possible to understand the conditions of functioning of rural communities under German occupation. This element is intended to present issues related to the Holocaust in rural areas, located far from ghettos, camps and German posts. Before World War II, over 100 Jews lived in Markowa. Almost all died during the Second World War. A few of them survived – thanks to the escape, conversion and help of Poles. A part of the village of Markowa with the largest Jewish population (just before the outbreak of the war, the village was inhabited by about 120 Jews). One of the families residing in the Kazimierz district of Markowa was that of “Bynia” – Beniem Müller, one of the Jewish farmers who owned land for cultivation. Kazimierz is also a place of massacre on the Jews. On the so-called Byniówka, the former plot of land of Beniem Müller, probably in the middle of 1942 the Germans murdered 12 people. There are known cases of Jews being shot by them on the road leading through the district, as a result of which about 10 people were killed. Jews from Kazimierz were hiding in the fields between Markowa, Sietesz and the Lipnik forest. Most of them were caught and killed. The basement of a residential building, used before the war as a temporary custody. During the occupation a place of detention of Jews captured as a result of hunts and round-ups organized by the occupant in Markowa and its surroundings. In late 1942, at least 17 Jews were imprisoned here for the night. They were captured and guarded by the inhabitants of Markowa by order of German occupiers. In the morning they were taken to the place of execution, the so-called “trench”, and shot there by German gendarmes. Inscriptions engraved by the convicts during the night before the execution have been preserved on the walls of the custody. 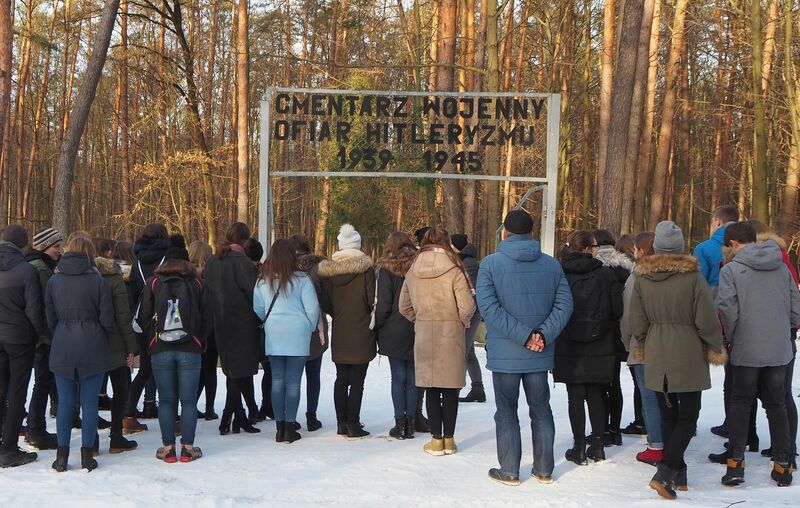 It is one of the most important and most meaningful memorial sites connected with the Holocaust of the Jewish population in Markowa. It is located on the eastern outskirts of Markowa. It overlooks the south-west and west of the village. The church of St. Dorothy, the buildings located by the Łańcut-Kańczuga road, and even the hills above Husów and Sietesz are clearly visible from here. Before the war, this place, commonly known as the “Bone Yard”, was a place where bodies of fallen domestic animals were buried. During the war, especially in 1942, the Germans chose it as a place of execution and burial of the captured Jews from Markowa and the surrounding area. At the end of 1942 more than 30 people of Jewish origin were shot here. The Pit was visible from the windows of the Ulma family’s house; probably the sounds of shots were heard there. It is even more impressive, then, that in the face of such a threat Wiktoria and Józef Ulma decided to give shelter to Jews from the Goldman family, for which all of them, together with their children, paid with their lives, executed by the German gendarmerie on 24 March 1944. A place of eternal rest for about 5,000 victims of German Nazis – Soviet prisoners of war, Poles, Roma and Jews. They include also victims of the Holocaust whose bodies were exhumed i.a. in the region of Łańcut, Przeworsk and Jarosław. The Jews murdered in Markowa are buried here – those shot in the “Trench”, in “Byniówka”, as well as those hidden by the Ulma family and shot together with them: Saul Goldman from Łańcut and his four sons, Lea Didner and Golde Grünfeld, as well as the daughter of one of them. On the cemetery there is also a grave and a monument in memory of Jews killed by Poles after the end of the German occupation in Kańczuga.